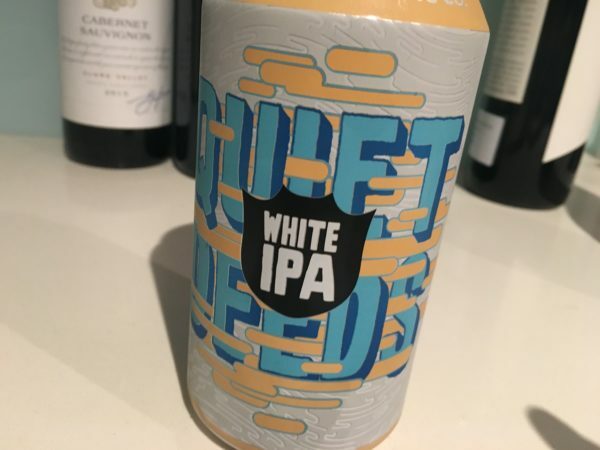 This Quiet Deeds White IPA comes in a proper full-size 375ml can. More decent cans like this please. A sessionable white IPA style, this is a mix of Cascade, Centennial and Mozaic hops, with pale lager malt, wheat and rolled oats. The whole kit and kaboodle. Golden yellow, the nose is more classic wheat beer than expected, with honey and a hint of porridge – less IPA-ish. There’s proper hop bitterness on the palate though, the wheat beer/IPA tug of war carrying right through the palate. There isn’t the hop shaped definition of a classic IPA, nor the soft richness of a full-tilt witbier, but this is still quietly drinkable. Not quite the ‘ideal summer drink’ as listed on the label, but tasty enough. IBU 45. 3.5 stars. 6%. BB 23/10/16. Would I buy it again? I’d drink it but wouldn’t be stocking up.